A new complement to the award-winning The World Almanac® for Kids, The World Almanac® for Kids Elementary is an exciting, fun resource especially for elementary school students. This new database provides a wealth of elementary-level content—including engaging illustrated articles, videos, interactives, Fun Facts, and more—in a colorful, kid-friendly format perfect for helping young children develop online research skills. 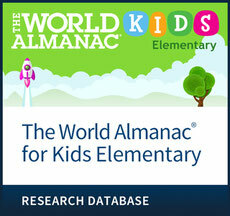 The World Almanac® for Kids Elementary includes exclusive, online-only material as well as content from award-winning Chelsea House and Facts On File sets and series—sources students, educators, and librarians can trust. It also features helpful teacher resources, including worksheets, graphic organizers, and classroom management forms educators can use with any lesson, plus science diagrams and projects to help reinforce lessons in a fun and engaging way. All about Birds: Articles, videos, Fun Facts, and games and puzzles on dozens of birds from African gray parrots to willow ptarmigans. Includes information on anatomy, physiology, feeding, and hunting behavior. All about Fish & Aquatic Life: Articles, videos, Fun Facts, and games and puzzles on dozens of fish and aquatic animals from anchovies to whale sharks. Includes information on anatomy, physiology, feeding, hunting, and endangered species status. All about Insects, Spiders & Worms: Articles, videos, Fun Facts, and games and puzzles on a variety of insects, spiders, and worms. Includes information on anatomy, physiology, feeding, and hunting behavior. All about Mammals: Articles, videos, Fun Facts, and games and puzzles on dozens of mammals from aardvarks to zebras. Includes information on anatomy, physiology, feeding, hunting, and endangered species status. All about Reptiles & Amphibians: Articles, videos, Fun Facts, and games and puzzles on dozens of reptiles and amphibians from adders to yellow-spotted river turtles. Includes information on anatomy, physiology, feeding, hunting, and endangered species status. America in Word & Song: Lively, inspiring articles on the history and impact of some of the documents, songs, and speeches that define the United States, including “America the Beautiful,” the Constitution, the Declaration of Independence, Martin Luther King Jr.’s “I Have a Dream” speech, the Pledge of Allegiance, and “The Star-Spangled Banner.” Includes videos and Fun Facts articles. Canadian Provinces: Details on the history, culture, and geography of each province or territory. Also includes landmarks, famous people, Fun Facts articles, elevation and outline maps, flags, and coats of arms. Famous Americans: A high-interest section highlighting major personalities from history and current events, including leaders of the American Revolution and Civil War era, political figures, Native American leaders, and social leaders and activists. Also features Fun Facts articles as well as games and puzzles. Famous Athletes: Highlights well-known and notable athletes in baseball, basketball, football, golf, hockey, soccer, swimming, tennis, and track and field. Includes Fun Facts articles. Famous Entertainers: Highlights major personalities in entertainment, including TV and movie stars, singers and musicians, and writers. Famous Explorers: Highlights courageous and well-known adventurers, astronauts, and explorers. Includes Fun Facts articles. Famous Scientists and Inventors: Highlights influential scientists, inventors, and mathematicians. Includes Fun Facts articles. The 50 States: Details and Fun Facts articles on all 50 U.S. states plus the District of Columbia and Puerto Rico, including population, climate, local history, landmarks, and famous people. Plus, Fun Facts articles and images of maps, flags, and symbols. First Civilizations: Articles, colorful pictures, maps, glossaries of vocabulary words, videos, and Fun Facts introducing Ancient Mesopotamia, Ancient Egypt, Ancient Greece, and other ancient cultures, including the history, major leaders, lifestyle, and religion of each civilization. Habitats in Our World: Fascinating articles covering geography, geology, flora and fauna, and the future of six different types of habitats found on Earth—wetlands, temperate forests, oceans, grasslands, deserts, and rain forests—with Fun Facts articles, videos, and games and puzzles. Holidays We Celebrate: Detailed information on the backgrounds, customs, and traditions of the world’s holidays and celebrations, from religious observances to independence days. Includes holiday-related Fun Facts articles. In Your Garden: Easy-to-understand information, along with colorful images, on all things botanical, including plants, flowers, and trees. Features videos, games and puzzles, and Fun Facts articles on all manner of plants. Leaders in Your Community: Includes career overviews of 28 different community leaders, from teachers and firefighters to doctors and politicians. Includes Fun Facts articles. Our Planet Earth: Fascinating articles describing how the Earth formed, rocks and minerals, fossils, erosion and weathering, earthquakes, volcanoes, and much more. Detailed illustrations, photographs, Fun Facts articles, videos, and games and puzzles help explain the science. Our Solar System: In-depth content on the sun and all the planets in our solar system, including Mercury, Venus, Earth, Mars, Jupiter, Saturn, Uranus, Neptune, and the dwarf planets including Pluto. Additional coverage includes phenomena like asteroids, comets, and meteors. With games and puzzles, Fun Facts articles, and videos, this module is perfect for studying our own solar system and the planets around us. Our Weather: In-depth articles covering weather, clouds and rain, and climate, plus important information on climate change, why weather changes, the difference between weather and climate, and major weather events such as thunderstorms, tornadoes, and hurricanes. Fun Facts articles, videos, and games and puzzles help students understand these important topics. Reader’s Corner: Lists of recommended fiction and nonfiction books for young readers, each organized by grade level. Includes videos about different letters of the alphabet and Fun Facts articles. What We Eat: Important facts about nutrition, including what we eat, vegetables, fruits, grains, meat and protein, dairy products, and fats, oils, and sweets, plus games, puzzles, and food-related Fun Facts articles.